For all the complaining about how sci-fi doesn’t get a chance on TV – spurred by regular announcements of favorite shows getting cancelled (often in their second seasons, which I will soon develop a theory about) – fans seem to ignore just how much genre TV there actually is these days. From the last year alone, both on network and cable: Lost, Supernatural, Fringe, Pushing Daisies, Terminator: Sarah Connor Chronicles, Eureka, Dollhouse, Reaper, Battlestar Galactica, Stargate Universe, Warehouse 13, Flashforward, The Prisoner, V, Torchwood, Dr. Who…and while the failure rate is far higher than the successes, let’s point out that Lost, Supernatural, the Stargate franchise and Smallville are (in some cases bafflingly – okay, just Smallville) pretty long-lived for TV series. Now, argue left and right about the relative quality and/or unfair-cancellation of any of these shows, but there sure are a lot of them, considering every year I seem to come across a panicky “Is sci-fi on TV dead?” article or 10. Is sci-fi television dead? Clearly, no. It’s just really hard to achieve success with a genre show. It’s an uphill struggle building an audience for it, considering that ideally, sci-fi is about new/different ideas, and TV networks and viewers all seem to agree that they’d prefer to be watching what they already were watching, thank you (more Jay Leno and CSI, please!). When you think of it like that, it’s pretty amazing networks EVER bother. Clearly, ABC wasn’t expecting people to tune in to “V”. * If they had, they probably wouldn’t have scheduled a months-long hiatus between episodes 4 and 5. ABC tried this “episode-pod” theory once before – in season 3 of “Lost,” and it did not fare well for them. So, it’s easy to read this as ABC assuming “V” would tank, and they probably wouldn’t have to air the remainder at all. As a series, it’s too soon to tell whether it’s merely entertaining or maybe Something Special. I enjoyed the pilot, and appreciated that it didn’t linger on the whole “Are the Visitors here to help?” swerve (since we all remember enough of the original series to answer, “No. They eat live mice.”). But the second episode does exactly what most second-episodes do, “Reiterate the pilot, the central themes and interpersonal conflicts, but faster and with a smaller budget.” So the second episode, while about as entertaining, didn’t actually move any of the pieces further along, and in a series following multiple, smaller story-threads, it’s a bad idea to waste time doing that (see: most of “Heroes”). The real star here is the casting department, for gathering a group of actors that are all very attractive, but at just the wrong angle, can look incredibly reptilian. 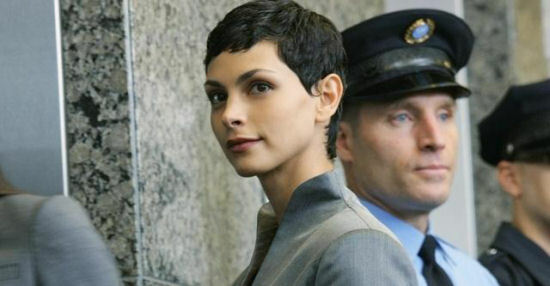 Morena Baccarin is a beautiful woman, with a gentle, soothing voice. But out of that soothing voice come blatantly manipulative phrases, and with the short haircut, suddenly her features seem slightly out of proportion – the nose and chin too small, the eyes and nostrils too prominent. Lizardy. And looking at Alan Tudyk (and I LOVE Tudyk)…don’t you half-expect a forked tongue to dart out of his mouth half the time anyway? On the other hand, “V” has a couple big problems at its conceptual level – foremost, these people act as though they have NEVER SEEN AN EPISODE OF “THE TWILIGHT ZONE.” Indeed, this show seems to exist in a world where “To Serve Man” was never even pitched in Rod Serling’s office. Everyone is either enthusiastically welcoming of the aliens and their massive fleet of intimidating ships, or they are depicted as racists screaming about how the aliens need to go home before they take all our jobs. There is no cynicism, no logical distrust, among anyone in this cast. Even FBI agent Elizabeth Mitchell only comes to question the Visitors’ intentions when they are made blatantly obvious to her. It would be nice to see how people in government are responding to this world-altering situation, but so far the series is unwisely hoping to keep the action at the “everyman” level. Which means a whole subplot devoted to Mitchell’s idiot teenage son and his even more idiotic chubby sidekick. Because that’s a point of view we really need. These are obviously not changes that can be made in before the break, but hopefully next year the series will expand its scope (and hard to say how big this scope is – no one seems to be spelling out if it’s a one-season miniseries or if they have plans beyond that). Or just kill the goddamn kids. Because apparently teenagers on television are either extremely stupid and selfish, or wise beyond their years. And speaking of oddly-familiar TV, everyone cross their fingers, as I subject myself to AMC’s remake of “The Prisoner,” which has not received a lot of kindness so far. *Though, yes, they probably were prepared for the massive drop in numbers between episodes 1 and 2. Eating live mice doesn’t make you evil. That is not the definition of evil! WELL IT DOESN’T MAKE YOU GOOD! Y’know, if the aliens just came out and said, “Look, we’re just here for any extra mice you might have scurrying about.”, they could avoid all this political hubub and explosions. We have enough mice for everybody. How can “The Prisoner” be bad with Sir Ian McKellan & Jim Caviezel? I mean to say – is that actually possible? Looking forward to seeing it but the trailer suggested that it lacked the wit and grit of the original.